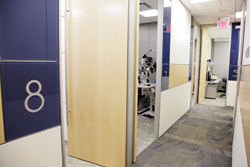 GEM Clinic was built in 2011 to improve delivery of eye care to our patients. Funding for this facility was entirely private with no government or industry support. This state-of-the-art facility is on the second floor of the Tuxedo Park Shopping Centre, located above M&M Meat shops. It is fully wheelchair accessible with two elevators and automatic door access. There is an accessible washroom in the office, and also a common wheelchair accessible public washroom on the second floor. 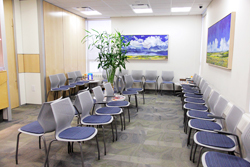 Our waiting area is spacious and comfortable, fit with video entertainment. There is a Safeway with a Tim Horton's, Shopper's Drug Mart, Starbuck's, Vita Health, Shell gas station and other great stores and services in the mall below. 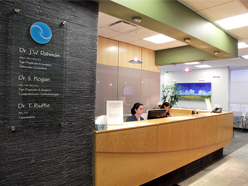 Our facility is fitted with the latest technologies to provide as much information about eye health as possible to help our doctors fully assess our patients and make the best decisions for their care. 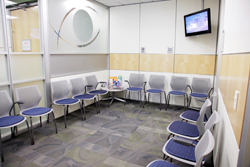 Our doctor examination rooms are also fit with up to date equipment to facilitate an easy examination experience. GEM Clinic is fully equipped with 3 different laser technologies (Argon, YAG, SLT) to provide a full range of laser treatments for Glaucoma and some retinal and post-cataract surgery problems. (Refractive laser surgery is not provided at GEM Clinic). This is by no means an exhaustive list. There were many people that helped us see this huge project to completion and we wish to thank them all. Needless to say, a lot of time, effort and expense went into this more than 2-year expansion project. 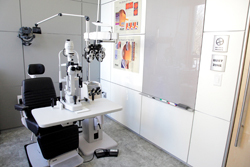 We hope that this provides testament to our ongoing commitment to exceptional eye care.